CONTINUING: See Janet’s selected art in Gallery 209 in Artists & Makers Studios 2, located at 12276 Wilkins Avenue, Rockville, MD 20852. Janet’s hanging paintings include encaustic and mixed-media pieces; unframed paintings and art cards are also available. 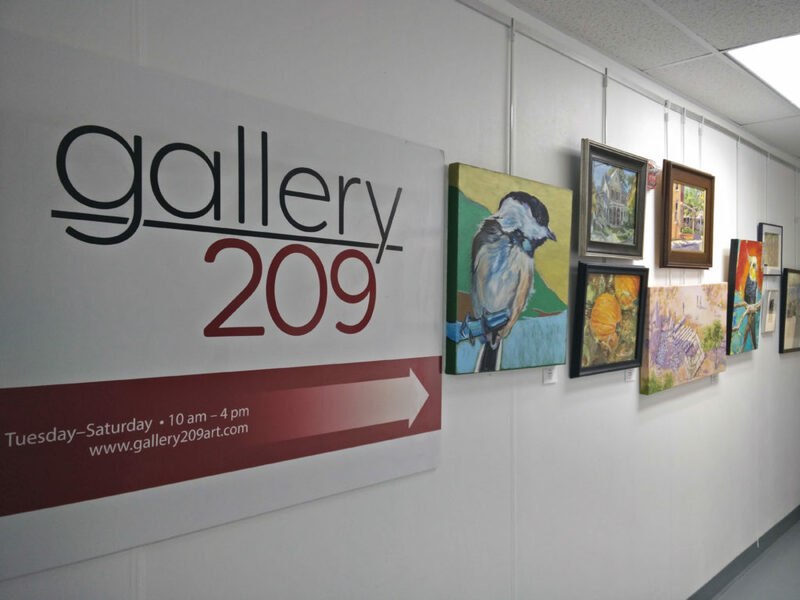 Gallery 209 expanded in February 2018 and now includes 22 local visual artists with varying styles in different media including watercolor, oil, acrylic, encaustic, color pencil, ink, fiber, mixed media, collage, metal, wood, sculpture, and more. Ongoing: Selected pieces are displayed at David’s Café Gallery, located in the Parkview Building at 1300 Spring Street (south-west corner of Georgia Avenue) in Silver Spring, Maryland. Exhibited art is changed every two to three months. My encaustic painting, “Hoppin’ Around Kensington” is on exhibit in the Kensington Town Hall Council Chamber from September 5, 2016 – September 3, 2018. My 3-D encaustic, “Hatless Fedora” was part of “The Wearable Hat Show” at Artists & Makers Studios, from September 8-27, 2017. Special Exhibit: Three encaustic paintings were part of a special exhibit of selected Montgomery Art Association artists at the offices of MedStar Cardiology Associates, located in Olney, Maryland. These paintings included “Gatherings,” “Squound Hole, Rare Peg,” and “Comings and Goings.” The exhibit ran from November 7, 2016 through May 7, 2017. 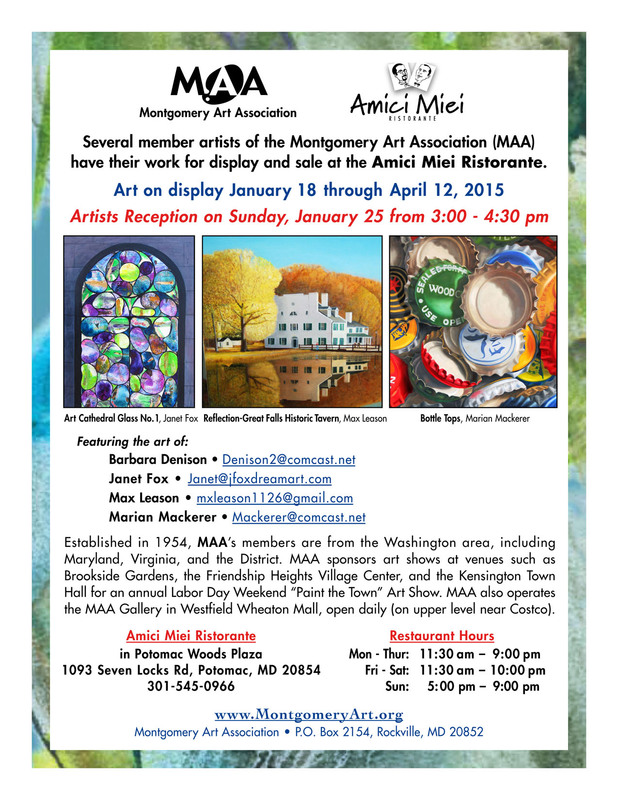 I was a Montgomery Art Association Gallery artist from 2011 through September 2016, when the MAA’s Gallery in Westfield Wheaton Mall, in Wheaton, Maryland closed. Two of my encaustic paintings, “Wise Woman” and “Wise Man” were on exhibit in the 2016 MAA Friendship Heights Members Show at the Friendship Heights Village Center from June 5 to July 4, 2016. These pieces were awarded first place in the Abstract & 3-D category! My encaustic 3-D mixed media painting, Dreams in Wax, was juried into the Wheaton Art Festival, on Friday, November 13 at Chuck Levin’s Music Center (Performance Space), at 11151 Veirs Mill Road, in Wheaton, Maryland. This juried pop-up art event wass part of the Wheaton Arts & Cultural Series. Eight of my encaustic and mixed media paintings were exhibited and for sale at the Montgomery Art Associations annual “Paint the Town Art Show, 2015,” held at the Kensington, Maryland Town Hall / Armory building September 5 – 7, 2015. “Dreamtime Journey to Somewhere,” one of my encaustic pieces, received Honorable Mention recognition in the 3-D and Abstract category! “Solo Exhibit: “Dream Themes and Art Flows,” at the Bethesda Public Library in Bethesda, Maryland, from July 1-31, 2015, included 12 encaustic and mixed media 2-D and 3-D artworks and companion commentary focusing on themes of water, crossings, energy and balance. Thank you to all who stopped to see it and for your wonderful comments. Featured Artist Exhibit, May 2015, at the Montgomery Art Association Gallery in Westfield Wheaton Mall, in Wheaton, Maryland. Thank you to everyone who stopped at the Gallery to see my exhibit; I am humbled by your wonderful feedback and support! My encaustic painting, “Kensington Kaleidoscope Clock,” was on exhibit in the Kensington Town Hall Council Chamber from September 2, 2014 – April 22, 2015. Selected pieces were on display at the Washington Suburban Sanitary Commission Executive Offices, located at 14501 Sweitzer Lane in Laurel, Maryland, from January 16 – April 17, 2015. Nine mixed media and encaustic paintings were exhibited in the Winter Gallery Exhibit at Amici Miei Ristorante from January 18 – April 12, 2015. Montgomery Art Association members Barbara Denison, Max Leason, Marian MacKerer were also in this small group exhibit. Amici Miei is an award-winning restaurant, offering authentic Italian cuisine at 1093 Seven Locks Road in Potomac, Maryland (in Potomac Woods Plaza). And thanks to the wonderful crowd who came to the January 25 artist reception. Two encaustic paintings, “Memorial Park Guardian” and “Red Rock by House” were on exhibit at the Kensington Park Library from November 1, 2014 to December 27, 2014. “My Little Kitchen Garden,” a three part encaustic work, was on exhibit at the Brookside Gardens Visitors’ Center from November 3, 2014 to December 15, 2014. Ten of my encaustic paintings were exhibited and for sale at the Montgomery Art Associations annual “Paint the Town Art Show, 2014,” held at the Kensington, Maryland Town Hall / Armory building August 30 – September 1, 2014. Two of my encaustic paintings were part of a small group exhibit at the Washington Suburban Sanitary Commission Office Gallery, located at 14501 Sweitzer Lane in Laurel, Maryland June 1 – July 31, 2014. 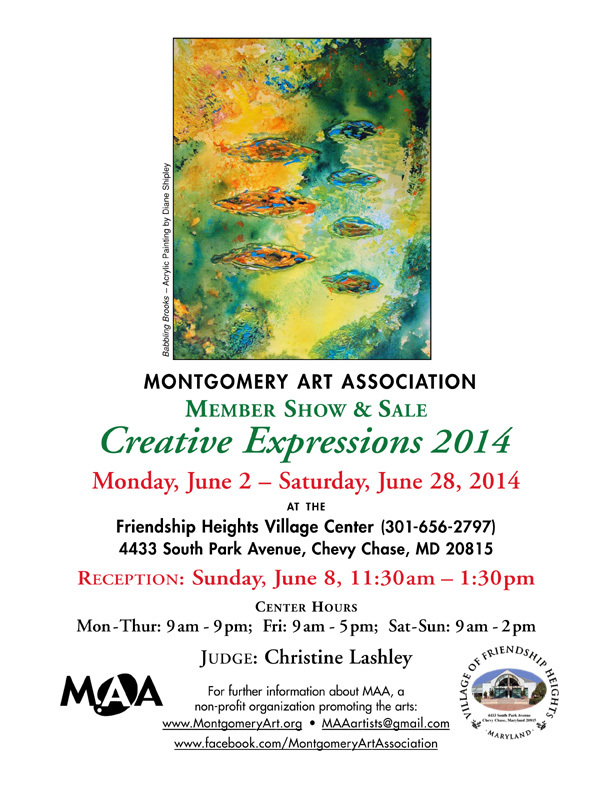 Two encaustic paintings were on display in the Montgomery Art Association’s annual group exhibit, “Creative Expressions 2014,” at the Friendship Heights Village Center in Chevy Chase, Maryland June 1-28, 2014. This exhibit featured 50 pieces in landscape, still life, portraits / people/ animals, and abstract and 3-dimensional categories. 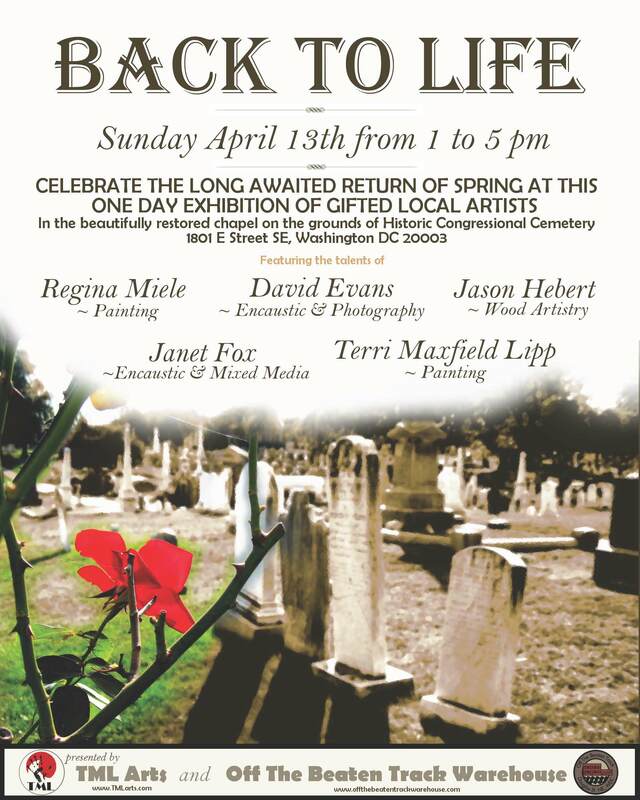 A big thank you to the more than 200 people who attended the “BACK TO LIFE” exhibit on Sunday, April 13, 2014 in the historical chapel building at the Congressional Cemetery, located at 1801 E Street, SE, Washington, DC. I hope you had an enjoyable time viewing and discussing my art and that of Terri Maxfield Lipp, Regina Miele, David Evans, and Jason Hebert. And an especially big THANKS to Terri Maxfield Lipp of TML Arts and Wendy Hauenstein of Off The Beaten Track Warehouse for organizing and presenting the exhibit and for the tasty refreshments!